Strain-and-sprain neck discomfort is common but preventable with therapeutic exercise. The essentials are icing and heat, gentle therapeutic exercise, and good posture. Sore neck? It's pretty common. And most men get neck pain for the same reasons they suffer low back pain. "In the vast majority of people, it's routine muscle strain and sprain," says Dr. Robert Shmerling, associate professor of medicine at Harvard-affiliated Beth Israel Deaconess Medical Center. "The neck has to support that heavy bowling ball on top." The remedies for neck and back pain also have some things in common. First, ease the early intense pain with rest, ice, and heat; then move on to gentle stretching and strengthening exercises. Later, avoid bad posture and other habits that could trigger another neck pain crisis. Use cold to numb the early acute pain and reduce inflammation. Take over-the-counter pain relievers to control mild to moderate pain. These include acetaminophen (Tylenol, generic brands) and nonsteroidal anti-inflammatory drugs (NSAIDs) like ibuprofen (Advil, Motrin), naproxen (Aleve), or aspirin. Use a neck collar for short periods to rest the painful muscles and tissues and ease your discomfort. "Collars have a bad reputation from people overusing them and getting weak muscles, but used a few hours here and there they can be very useful," Dr. Shmerling says. Apply heat—either with a heating pad or by using a warm whirlpool bath if one is available—after a day or two, once the acute pain calms down. Should you go to a chiropractor to get your neck "cracked"? Dr. Shmerling counsels against sudden, strenuous manipulation of the neck. "It may be fine for low back pain, but avoid it for neck pain," he says. Therapy will likely combine isometric and range-of-motion exercises. In isometric exercise, you tighten the neck muscles against an opposing force—such as your own hand, which you "push against" with your neck muscles. Range-of-motion stretches attempt to progressively relax and lengthen the neck muscles. Physical therapists can offer other therapies that, while not proven in research trials, seem to offer some people ease and comfort. One option is ultrasound treatment of the sore tissues with high-frequency sound waves. A physical therapist can also perform traction, using the hands or special equipment to gently stretch the neck muscles. You can also get equipment by prescription to perform neck traction at home, but follow the therapist's instructions carefully. Finally, take inventory of your posture or daily habits that could trigger neck pain, like sitting for extended periods in positions that strain the neck during reading, TV watching, computer work, or sleeping. 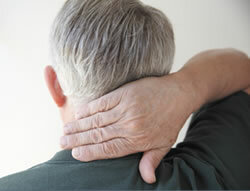 Attending to the cause may stop some flare-ups of neck pain at the source. Is it something more serious? If neck pain is severe, lasts for weeks or months, drastically limits your ability to move your head, radiates into the shoulders, or feels worse in the morning, consider seeing a doctor. Fever or weakness or numbness in the arms are other "red flags" that warrant additional evaluation. In some cases, an underlying physical problem, such as arthritis, an infection, or a compressed nerve, may be the cause. Depending on the diagnosis, you may need additional treatments or even surgery to relieve the pain and get back to your normal activities. [A] Look straight ahead. [B] Tuck your chin in slightly and move your head backward, slowly and smoothly. Be sure to keep your head level; you should be gliding your head backward, not bending or tipping it. Hold for five seconds. Repeat five times.